AVSC Academy Squads are 'Olympic Themed' with progression from Sydney and Athens squads to Beijing & Rio. When swimming competitively, swimmers will be competing in age groups, from 8 years old, according to ASA Rules. 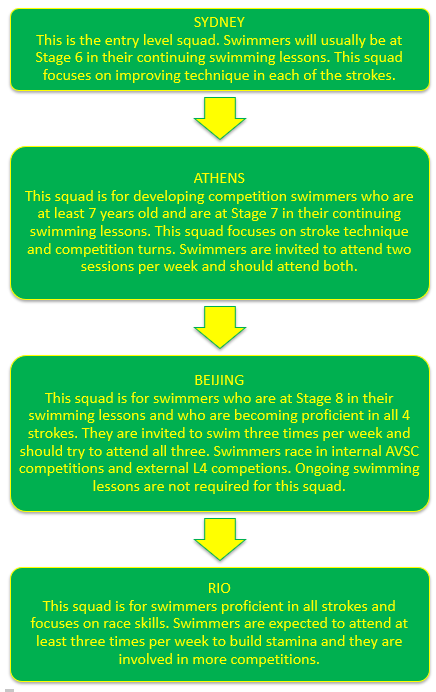 The AVSC Academy squad structure has been developed to support this development to a competitive swimming environment. To become the best swimmer you can be, developing technique in four competitive strokes, individual medley and relay skills. To build stamina by using all training opportunities offered. To enter internal, and where possible, external competitions, to measure yourself against your previous performances. To use feedback from that experience to further develop your swimming technique.